Thu., Nov. 3, 2016, 4:33 a.m.
Pac-12 fan bases tired of Oregon’s reign atop the football hierarchy may be getting a little relief this fall –and a dose of the same old medicine in basketball. The Ducks separated themselves from the other contenders in the last two weeks of the 2016 season, winning their last five games and sweeping through the Pac-12 tournament. By the time they came up just one win short of the Final Four – while only one of the other six Pac-12 teams that made the NCAAs won a first-round game – it was clear there was Oregon, and then everyone else. And the offseason made it only more evident. 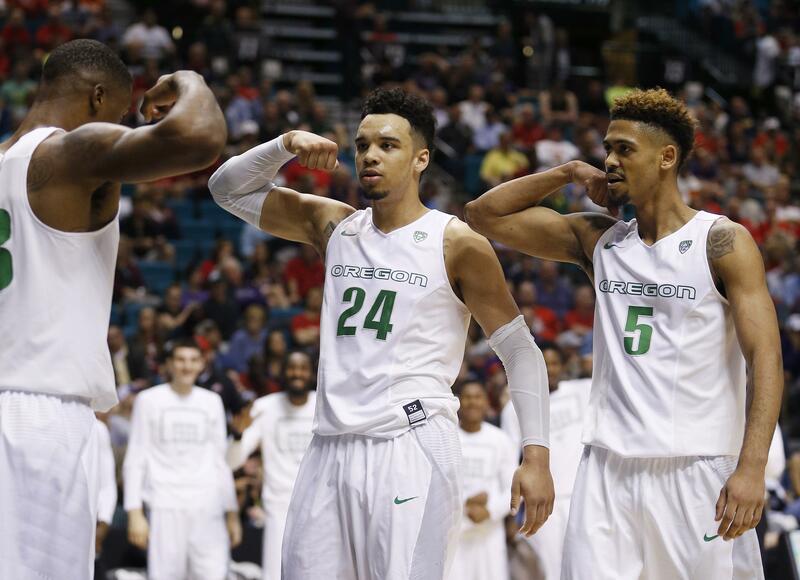 It started when Dillon Brooks and Tyler Dorsey took their names out of the NBA draft after some early-entry footsy. Then shot-blocker Chris Boucher was granted an extra year of eligibility, as was Villanova transfer Dylan Ennis after injury wiped out his senior year. That’s three likely starters there, plus national assist-to-turnover leader Casey Benson and then came the signing rush – Oregon player of the year Payton Pritchard, juco POY Kavell Bigby-Williams, Michael Cage’s kid and Seattle steal Keith Smith. Yet if the Ducks are consensus favorites, it’s not necessarily an indictment of the league’s strength. The seven NCAA participants a year ago was a record, and there’s a legitimate chance to duplicate it – and maybe even exceed it. Whether Washington can pull itself out of its recent bog of mediocrity by riding the wizardry of freshman Markelle Fultz, one of the nation’s top recruits. If the Huskies don’t, it could finally be the end of coach Lorenzo Romar’s run in Seattle. They’re much less forgiving of not making the NCAAs at UCLA. The Bruins’ dismal showing last year puts some heat on Steve Alford – and he responded by landing not one but two big-time recruits in Lonzo Ball and T.J. Leaf. If Jerod Haase can get more done at Stanford than Johnny Dawkins did, and return the Cardinal to the Pac-12’s upper echelon. Outlook: Hotshot recruit Terrance Ferguson decided to go none-and-done and turn pro instead, making the Wildcats hopes of dethroning Oregon that much tougher. Three of UA’s top four scorers are gone, too, but there’s still Alonzo Trier and Kadeem Allen, two aggressive, attacking guards. Dusan Rustic will hold down the middle until talented Lauri Markkanen gets up to speed. Outlook: Buffalo transfer Shannon Evans and a Top 25 recruiting class have Bobby Hurley feeling better after he staggered through his first year with a lousy offensive team. Tra Holder, who played on the Pac-12 all-star team to Australia, will try to hold together a group newcomers, including Rainier Beach product Sam Cunliffe, a freshman of the year candidate. Outlook: Big Ivan Rabb’s surprise decision to pass up the NBA draft was a boost to a lineup that lost three potent scorers. Long Jabari Bird also returns as a dangerous 3-point threat, but the backcourt must be remade around Columbia grad transfer Grant Mullins and senior Sam Singer. Kameron Rooks and Kingsley Okoroh are two giant rim protectors. Outlook: They’re big on the five-year plan in Boulder. Forwards Wesley Gordon and Achilles-rehabbing Xavier Johnson return for their fifth seasons, and transfer seniors Derrick White and Josh Fortune add experience at guard, where 3-point bomber George King also returns as the Buffs’ top returning scorer. Tory Miller tries to pick up Josh Scott’s missing muscle up front. Outlook: It’s tempting to mail them the trophy now, what with a bonus recruiting class – including JC player of the year Kavell Bigby-Williams – joining five of last year’s top seven. Dillon Brooks and Tyler Dorsey pulled out of the NBA draft, and Chris Boucher and Dylan Ennis each got an extra year of eligibility so the Ducks have it all: size, depth, scorers and scads of shot-blockers. Outlook: The departure of Gary Payton II means this team now belongs to Tres Tinkle and Stephen Thompson Jr., two of the league’s top sophomores. OSU needs better work on both ends inside, however, and hope Drew Eubanks and JC import Keondre Dew provide it. More firepower comes from Gig Harbor’s JaQuori McLaughlin, who spurned both UW and Gonzaga. Outlook: Former NCAA regulars, the Cardinal made it just once under Johnny Dawkins, which is why Jerod Haase is now in charge. Aside from two notable – but slender – front-court newcomers, he’ll try to get more of Dawkins’ leaving, including oft-injured forward Reid Travis and capable guard Dorian Pickens. But the Cardinal still seem short on scorers. Outlook: Underachieving UCLA has a math problem: making the team greater than the sum of its parts. Holdover starters Isaac Hamilton, Bryce Alford and Thomas Welsh should be worth 23-25 wins instead of 15. And adding off-the-charts freshmen Lonzo Ball and T.J. Leaf should turn the Bruins into instant contenders, but somebody has to play D – and someone has to make it a team. Outlook: One whiff of success and six players with eligibility bailed, clouding the outlook. Leading scorer Jordan McLaughlin returns, however, in a solid backcourt with Elijah Stewart. Bennie Boatwright is a 6-10 3-point shooter who needs to establish himself inside more, and 6-11 Chimezie Metu is a star in the making. Watch out for Louisville transfer Shaqquan Aaron, too. Outlook: An NCAA thumping at the hands of Gonzaga was a downer end to Utah’s best season in a decade, and only forward Kyle Kuzma and guard Lorenzo Bonam return from the regular rotation. Transfers David Collette (Utah State) and Sedrick Barefield (SMU) become eligible at semester and will help, and redshirt big man Jayce Johnson needs to play major minutes. Outlook: How much can Markelle Fultz get done in one? Pac-12’s top recruit will be in the NBA in a year, but first he needs to carry the Huskies into the NCAA tournament after five years away. With three major departures, UW needs big gains from Malik Dime and Matisse Thybulle – and much better shooting, rebounding and commitment to defense throughout the lineup. Published: Nov. 3, 2016, 4:33 a.m.